BLOEMSMA & VAN BREEMEN 157' "FLYING EAGLE"
The Dutch shipyard Bloemsma & Van Breemen is building a 157 foot motoryacht designed by Reymond Langton Design. This being the biggest yacht the yard has ever built, suitable solutions have been found to satisfy the demanding MCA and Lloyds rules. As already said, the design of the 157 footer "Flying Eagle" is the work of Reymond Langton Design, as are the interiors, created in collaboration with Struik & Hamerslag Yacht Interiors, while the naval architecture was entrusted to Vripack Naval Architects. 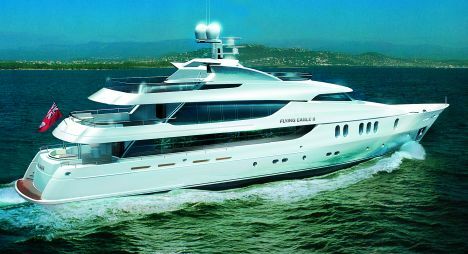 The result of this cooperation is a modern motoryacht with a thrusting and sporty profile. "Flying Eagle" is structured on four decks. The lower houses the night areas for crew and guests, each with private access, a spacious engine room with two powerful Caterpillar 3512 engines, and the tender garage with a foldaway platform to facilitate launching and recovery manoeuvres. 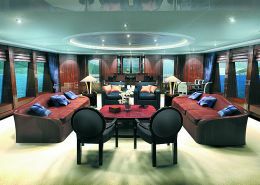 On the main deck the owner's area is in the wide body zone forward while the rest of the deck houses the saloon, the dining area and the galley. The modern bridge, which occupies the whole beam, is on the upper deck and is equipped with all the instrumentation for controlling the onboard systems as well as, obviously, navigational data. The sundeck is fully equipped for relaxation and for housing and handling the tender and two jet skis. On board plant is to latest generation technology specifications, including Intelect USA audio-video alarm systems, stabilisers to eliminate roll and pitch when the vessel is stationary and a Van Der Velden electro-hydraulic rudder system. The performances declared by the Dutch yard are a maximum speed of around 16 knots and cruising speed of around 14. For further information contact Bloemsma & Van Breemen Shipyard, Strƒnwei 30, 8754 HA Makkum, Netherlands; phone +31(0)515231785; fax +31(0)515231844; e-mail werf@bloemsma- vanbreemen.nl; website www.bloemsma-vanbreemen.nl. Declared cruising speed: 14 knots.